Erin Dealey is a bright star who shines in the same sky with me at the East/West Literary Agency. She and I hit it off very recently because she manages the @EastWestLit Twitter feed…and I’m quite the prolific Tweeter myself. The more I learn about The Divine Miss Erin, the more I positively adore her. I have no doubt you will, too! Erin Dealey: Not having to do report cards. ED: I’m still correcting papers! Sometimes you think it’s so cute and clever. And sometimes you want to give it to the neighbor. ED: Hmmm…at Sharon Creech’s house? Wouldn’t that be cool? I’m a huge fan. Actually, I want to be Ms. Creech when I grow up–but I’m still in my Bloomability stage. ED: Kid’s table + holiday dinner = fa-la-la-frolic! ED: Apple–great climbing, healthy fruit, mmmm-delicious pies. ED: For those who say they want to write a book someday: “Someday” is NOW. 1. Finish all my projects! 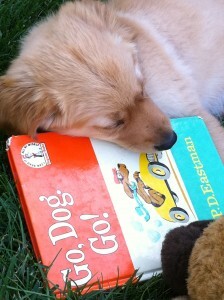 Erin writes in many genres, from board books to YA. Her picture books with Atheneum, Goldie Locks has Chicken Pox and Little Bo Peep Can’t Get to Sleep, have taken her to school visits as far south as Brazil and as far north as Tok, Alaska. She is a Language Arts/ theater teacher with decades of classroom experience and has lived to tell about it. In the summer, she’s “Drama Mama” aka the head of the theater department of Sugarloaf Fine Arts Camp, which is where she is right now. As a member of the Area 3 Writing Project (UCDavis), Erin leads writing workshops for teachers and students of all ages. 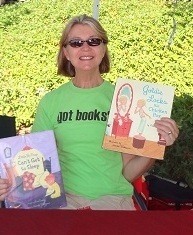 If you’re wondering why she looks familiar, Erin was co-Regional Advisor for SCBWI CA North/Central, and has presented at SCBWI conferences, reading associations, school library associations, and the California Kindergarten Conference. If you’re still reading this (thanks! 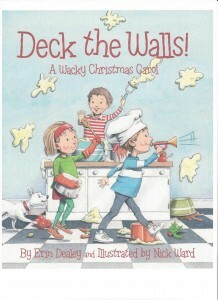 ), you can find her full bio and Writer’s Rap at http://www.erindealey.com and Twitter: @ErinDealey. This entry was written by Lesley Fairy and posted on July 8, 2013 at 7:00 am and filed under Interview. Bookmark the permalink. Follow any comments here with the RSS feed for this post.